Everyone who has listened to my videos over the last few months has asked repeatedly about the song being played and I have explained that my daughter is a Singer/Songwriter and plays the acoustic guitar ;-) she is self taught and has been writing all her own music and lyrics since she was 16 and she FINALLY is allowing me to put one of her songs up, she is a little shy about putting herself out there so show my baby some love......Yay!! Here is my baby girls first "Single" and you guys get it first! 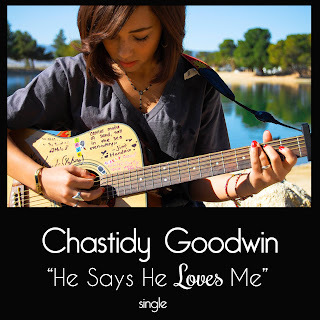 Chastidy Goodwin: "He Says He Loves Me"
It's so good! You guys are one talented family. And is that her playing the guitar? I know you said she is self-taught, and that is pretty amazing. Yes she is playing and singing. Thanks! What a talented family! Your daughter is really good. She has a BEAUTIFUL voice!! Mimi she sounds great, what a songbird, I hope she goes far with it!!! She's good! Tell her to be brave and keep putting herself out there. You just never know what could happen! I just downloaded it. Love the sound and feel of it. I teach Zumba part time and I will probably use this a cool down song in one of my classes. Look out for more business - I will promote it hard! OMG! She is sooooo talented! She is crazy talented. She has a wonderful sound! Love it! Let her know it think it's great! What a talented young lady!! Keep it up, girl!! awwww!!! MiMi she sounds AAAAMMMMAAAZZZING!!!!!! i love acoustic music.. her voice reminds me of Colbie C... she will go very far.. loooove it!! i cant wait to hear more and buy her CD!! Just purchased! You must have been reading our minds - I was going to email and ask is the song available for purchase. I love it and Chastidy's voice is beautiful. She sounds amazing and professional like she has been doing this for a long time! Good luck to her! Very pretty voice!!!! she sounds amazing! Wow! She sounds awesome. She reminds me of Jamie Grace. Tell her to keep up the great work. Wow! What a voice, love the lyrics, and music is wonderful! So good, I had to download it! She is very talented! Thanks for sharing! I can't believe she just made me cry!!! You and your family are amazing. Wow!! She is awesome!! What an amazingly talented and beautiful family. Wow, what a beautiful voice! She has a bright future ahead of her! She has a beautiful voice!! Love the song!! This song is gorgeous! I can't wait to hear more! She is so talented! Oh boy! Aw Mimi, she's great! I love her vibe.